So Easter is right around the corner. What?! I swear it feels just like yesterday when I put my Christmas tree down… Time flies and this year I am just not feeling the Easter mood. I still have got some time to feel festive though, so yesterday I decided that taking some actions was in order. And what would any nail polish obsessed beauty blogger do? Well… paint their nails of course, so that’s what I did. 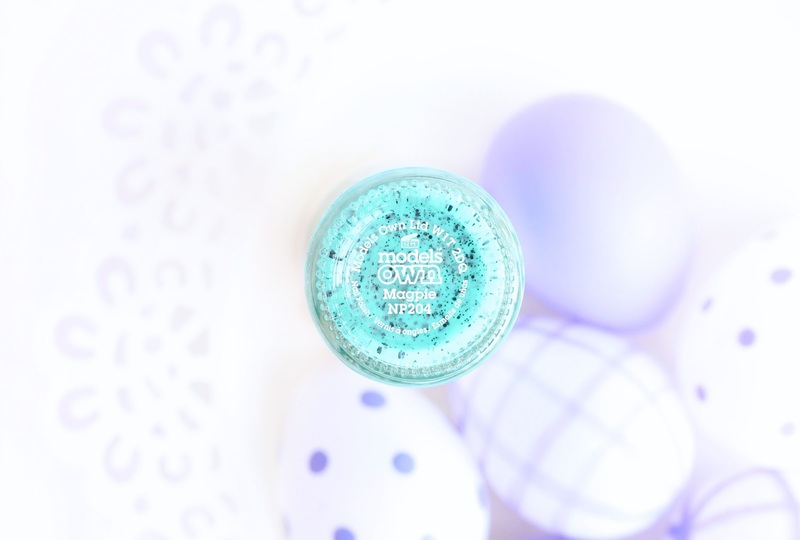 I rummaged through my stash and there it was waving at me – the perfect Easter nail polish! Meet the oh-so-cute Models Own Magpie (here). This little mini egg-resembling gem instantly caught my heart when I first bought it a few months back with its lovely fresh and happy vibe. It’s pastel, yet it’s bright and the gorgeous minty / turquoise shade is just ideal for spring and summer. I absolutely adore the little egg shell speckles running through the polish and if you are fan of the Illamasqua Speckle offerings (here) then you really need to check out Magpie and the rest of the Models Own Speckled Egg collection (currently on offer here) – the shades are much more vibrant and they are literally a fraction of the price. Magpie is hands down my favorite of the bunch. I am a sucker for mint tips, plus I find it really wearable and it’s definitely one of those ‘suit all skin tones’ colors. Love. Have you tried Models Own Magpie before? Which shade from the collection would you like to get your mitts on this season? Omigosh, this really is the perfect Easter shade. It looks just like a mini egg! How pretty. Can't believe it is easter already! I remember these being released last year!!!!! So so gorgeous. I need to find a models own stockist here in Aus stat! I love this shade. Blue with black, perfect! So cute, perfect for easter! That's so cute and it so reminds me of Easter. I'm still planning what I want on my Easter nails. This shade is just perfect! Mobdro Online TV for PC gives all the web's complimentary video streams. Mobdro app cost-free video clip streaming application.